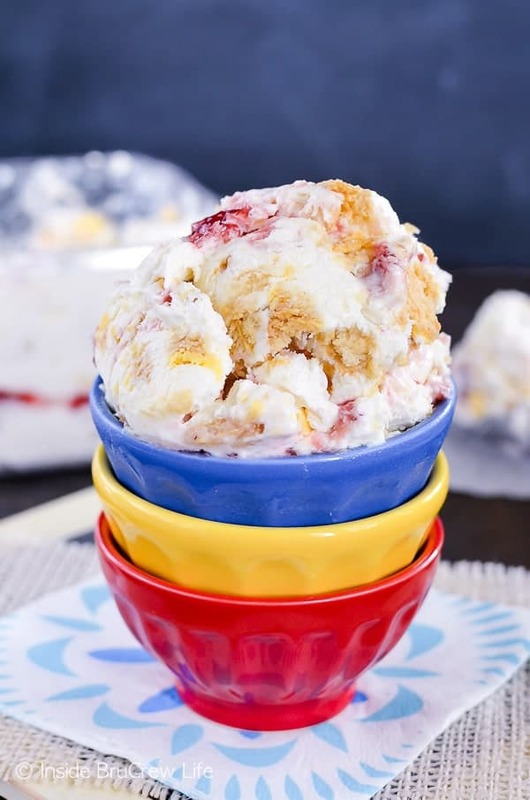 Celebrate National Ice Cream Month with a bowl of this Lemon Oreo Strawberry Swirl Ice Cream. 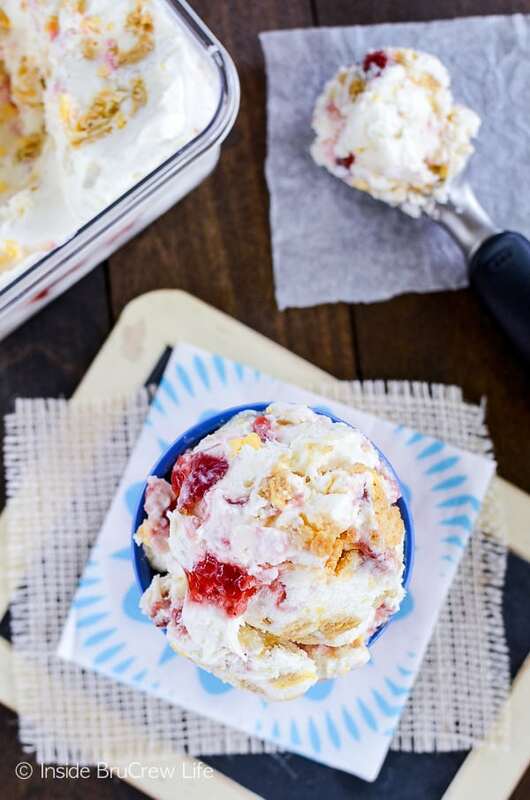 Swirls of cookie chunks and strawberry preserves give this no churn ice cream a pretty color and taste. This summer has been different than most. Usually we plan one week long family vacation at the beach. Now that we live where everyone vacations our trips look a little different. We still planned a beach vacation for one of our weeks, so I guess it isn’t that much different. The difference is that we are using our other weeks to head back to Texas and Indiana to see friends and family. With all these trips, summer seems to be flying by. Whatever happened to the days when summer vacation seemed to last forever? The older you get, the shorter breaks seem to get. Or is it that we just pack them with more things to do, so it seems shorter? Even with all these trips, we are enjoying some lazy summer days on our back patio. 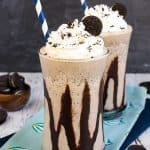 Relaxing with a Frozen Salted Caramel Mocha Hot Chocolate or a bowl of homemade ice cream is a great way to enjoy a hot summer day. 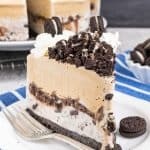 We usually keep our freezer stocked with cookies and cream, vanilla, coffee, and my daughter’s favorite homemade Oreo Fudge Cappuccino Ice Cream. Even though a carton of ice cream is so easy to buy, I like creating fun unique flavors in our kitchen every once in a while. I mean, can you buy Reese’s Fluffernutter Ice Cream anywhere? Did you know you can make ice cream without an ice cream machine? It’s actually quite easy.Whipping cream and sweetened condensed milk is all you need for the base of no churn ice cream. That’s right. 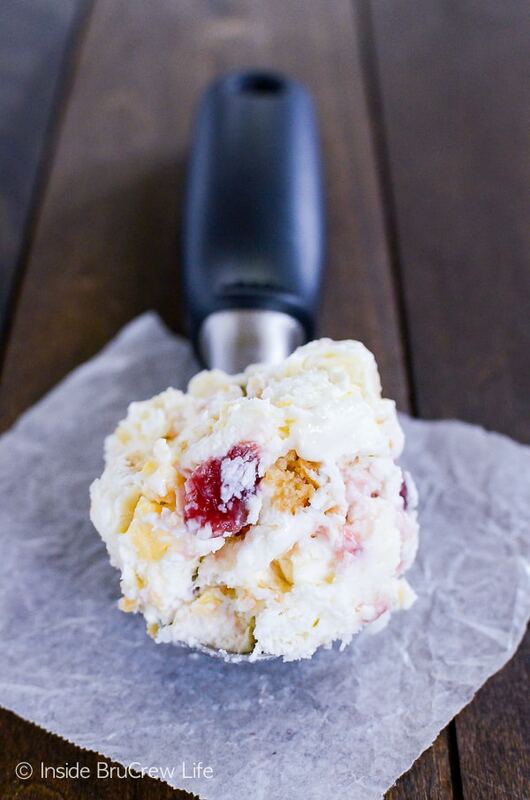 Two ingredients and you can have a creamy homemade ice cream in your freezer. I always add cream cheese, so mine is actually three ingredient ice cream. Of course, I like to have fun with things I find in my cupboard too, so it’s usually more like four or five ingredient ice cream. 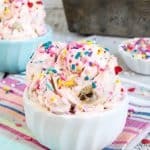 Since July is National Ice Cream Month, I did what anyone would do and pulled a few things out of the pantry to jazz up some homemade ice cream. I mean we have to celebrate these fun food holidays, right? A whole month of ice cream of celebrating sounds great. Just don’t tell my shorts and swim suits that we are going to celebrate all month. I have a feeling they won’t like me much after this. Start by putting your metal mixing bowl and whisk beater in the freezer for about 30 minutes before you start. This will get the bowl nice and cold so the heavy cream will whip up faster. Beat the whipping cream until light and fluffy. Set that aside. 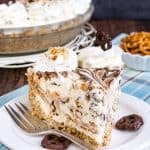 Adding a package of cream cheese to the sweetened condensed milk gives the ice cream a little bit more of a creamier cheesecake texture. So beat together the cream cheese and sweetened condensed milk until creamy. Stir in some lemon juice. Adding the lemon juice will give the ice cream a slightly icier texture. Just let the ice cream sit out for a few minutes to soften up before you start scooping. Now fold the fluffy whipped cream into the cream cheese mixture. 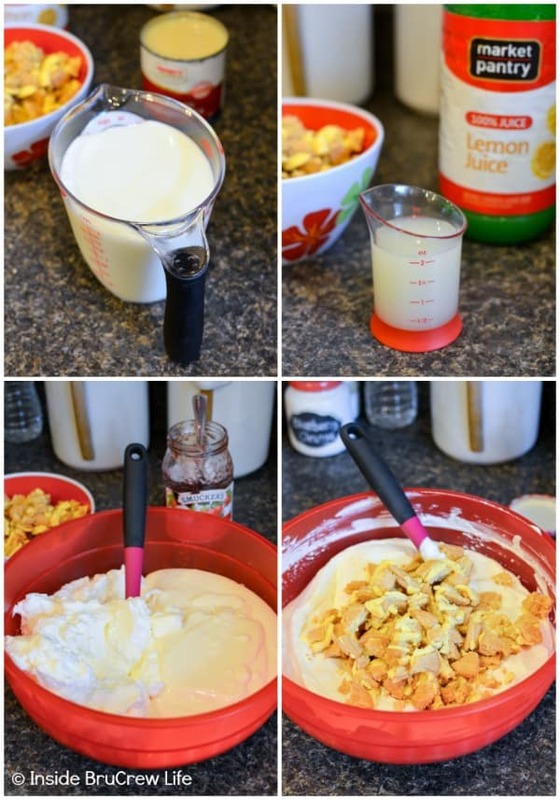 At this point you can freeze the mixture and have a delicious and easy lemon ice cream. But let’s add some more fun. 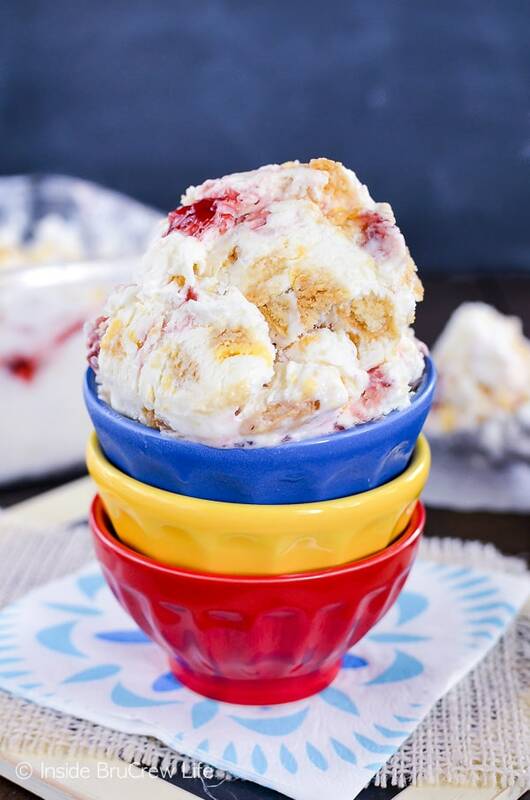 Chunks of lemon Oreo cookies and swirls of strawberry preserves kind of fun. Stir the cookies into the ice cream gently. It’s ok if the cream filling comes out of the cookies as you stir. This just adds more color to the swirls when you scoop it out. Spoon about a third of the mixture into a bowl. Swirl a few small spoonfuls of strawberry preserves into it. A little goes a long way, so do not over due it on the spoonfuls. Repeat this two more times ending with fun red swirls on top. Be careful as you do each swirl. Do not let your knife go down all the way to the layer under it. Too much swirling and it will become strawberry ice cream. Swirl gently so it stays lemon ice cream with strawberry swirls. Got it? Now for the hardest part of the entire recipe. Put the bowl in the freezer and walk away for hours. I know. That’s a hard thing to do when you want homemade ice cream right now. I suggest making this right before going to bed. That way visions of strawberry lemon swirls will float through your head as you sleep. Plus, waking up to ready to go ice cream is so sweet. Literally. What are you waiting for? 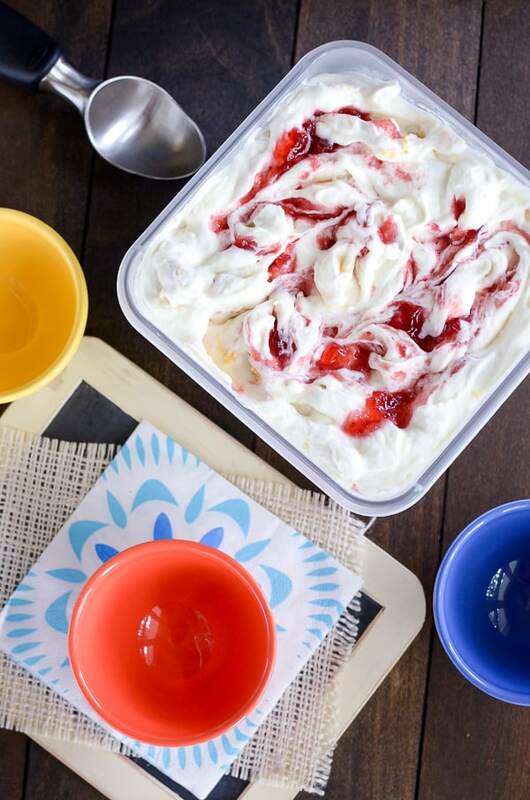 Let’s celebrate the rest of the month with a bowl of Lemon Oreo Strawberry Swirl Ice Cream every day. I’m game if you are. Caramel Snickers Ice Cream – candy bars, peanuts, and caramel swirls make this sweet summer treat. Chill your metal bowl and/or beater blades for at least 30 minutes. Beat the heavy whipping cream until stiff peaks form. Beat the cream cheese until creamy. Slowly add the sweetened condensed milk and beat again. Stir in the lemon juice. Fold the whipped cream into the cream cheese mixture gently. Stir in the cookie chunks. Spoon a third of the mixture into a freezer-safe container. Drop a few spoonfuls of strawberry preserves on top. Swirl gently with a knife. Repeat two more times, ending with strawberry swirls. Freeze until solid, about 4-6 hours. Store in the freezer in a covered container. *The lemon juice added to the mixture will result in an ice cream that is a little bit icier. Let the container sit out on the counter for a few minutes before serving to soften it up. Gotta love it when you don’t have to use your AC or your ice cream maker! And this flavor combo – trio of triumph! (er, something like that) Lemons, strawberries and golden Oreos needed to happen yesterday. Thanks so much for sharing! Jocelyn, will you pretty please send some of your wonderfully cool summer weather our way? We’re supposed to hit 110° again this weekend — oof! And if you can’t send the weather, at least send some of your gorgeous ice cream. This fruity one looks so refreshing, and your daughter’s chocolate/coffee/cookie dough one sounds right up my alley! Yum!! Yuck for such hot weather! I don’t envy you! Thanks Amy! This ice cream sounds freakin’ amazing!! When I saw that first photo, my jaw dropped… LOVE IT!! Your daughter has amazing taste in ice cream flavors! This one is incredible. I’d eat it all, even if it’s not super hot out! Walk away for hours??? But I’ll know it’s there and I will constantly peak into to taste it! Gosh Jocelyn, this is some seriously good ice cream! 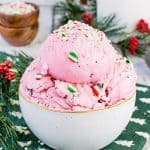 The ice cream sounds delicious…so glad to see a recipe for ice cream where you don’t need a ice cream maker…..way to go, looking forward to making this……. Gorgeous pictures, Jocelyn! I want a giant bowl if this ice cream. The flavors sound delicious! Pinned! I need a big bowl of this right now! So delicious! Love this flavour combination! So glad I don’t need an ice cream maker, I just HAVE to make this!! I bet this is fabulous! we haven’t made any ice cream yet this summer……I think it’s time to pull out the machine! What a perfect ice cream flavor! Lemon oreos and strawberry sounds and looks delicious! I love your last photo with a big scoop 🙂 Pinned! hehe, my cupboards look like a mini mart, too! I’m constantly trying to pare down, but I never can! This ice cream sounds fab! First of all, thank you times a million for making this a no-machine recipe! Second of all, I have been meaning to try those lemon Oreos, and I think I just got the perfect excuse to pick up a pack! 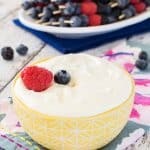 I love your flavor combo with this ice cream, and the fact that you can make this with out an Ice Cream maker makes this a winner! Those lemon oreos are SERIOUSLY my favorite! They are tricky to find sometimes, but so worth the effort. LOVE this recipe, pinning! I love this non-chocolate version of cookies and cream! Lemon with strawberry tastes like summer to me! We HAVE been getting hot,humid, hard to breathe Midwest summer weather and ice cream sounds like the perfect antidote ! Omg, I’m loving the flavor combo Jocelyn! And with oreos makes it even better! I am on a total Oreo kick right now and I just so happen to have 2 packaged of the lemon variety hanging out in my pantry. I think this ice cream may be the perfect reason to break them open! This ice cream sounds awesome! PINNED! Wow, I am totally in I love with this ice cream combo! 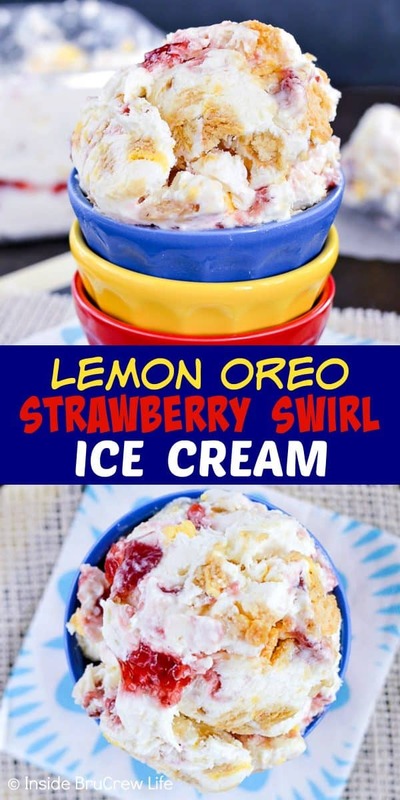 Lemon oreos totally have my heart and throwing them together with a strawberry swirl ice cream sounds amazing! Pinning!